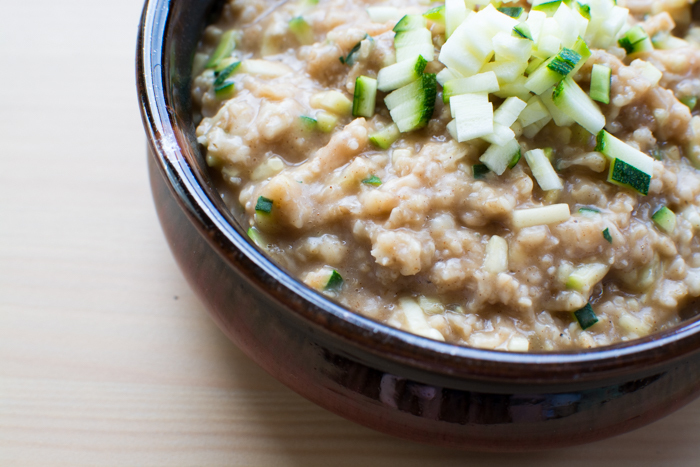 Today we’re making zucchini bread oatmeal! Our 2nd year of WSU Organic Farm CSAs starts at the end of May and we’re pretty excited. It won’t be too long until fresh fun-shaped local zucchinis grace our weekly pickup. If you know me you know that I’m always trying to add things where they may or may not belong like chlorella oatmeal with chocolate and mint, a really-ugly-kind-of-tasty breakfast. Ugh. Well, today’s is WAY better. Trust me. And because I’m an all-year-round kind of gal when it comes to oatmeal, you will probably see me on ig enjoying this or something similar. One medium zucchini has only 33 calories, less than 1 gram of fat, 2 grams of fiber and protein, 58% of your daily recommended vitamin c, and 15% vitamin b-6. This recipe uses about half of a medium zucchini, so throw the rest into a sandwich, salad, or soup at lunch. 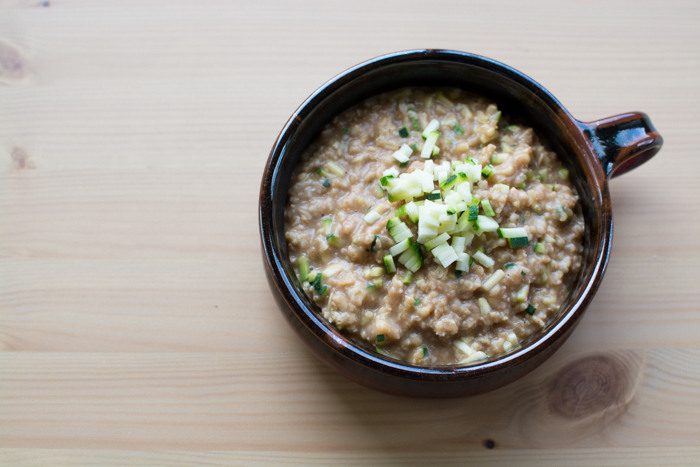 I bet you could even do this overnight-oats-style! 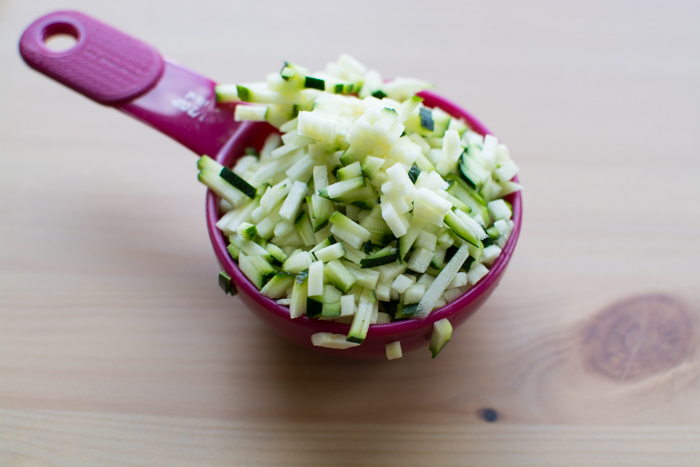 Freshly diced zucchini is gorgeous!! I used the Borner Mandolin with julienne blade, but you could also use a knife to cut thin planks and then strips of zucchini (more info). Just a few minutes on the stove and breakfast is served. 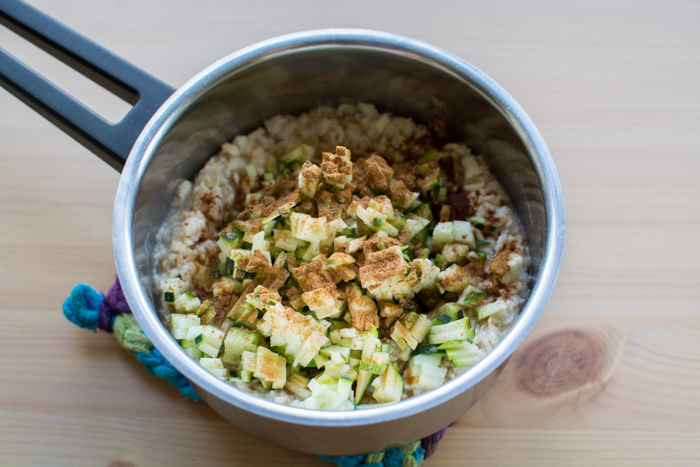 Add oats, zucchini, water, cinnamon, coconut sugar, and nutmeg to a small sauce pan and bring to a boil, turn heat down to low and simmer for about 5 minutes until oats are fluffy and cooked.